The bright red seeds harvested from a tropical shrub. Often used in South American dishes, it has a subtle, earthy flavor and aroma. It has also been used as a dye and a natural food coloring for centuries. Brazil is the main producer and exporter. Known here as urucum or colorau the seeds are used as a natural red food coloring in the food industry, cosmetics (lipsticks) and also in the Brazilian cuisine. The color result is similar to paprika, and it does not alter the flavor of the food. Also, Brazilian indians and other Latin-American indians use the seeds to make body paint. Annatto is also widely used in coloring cheeses, most famously Red Leicester. It is also rubbed on the rind of langres to produce it's characteristic color. The seeds are sold whole, crushed, or in a paste. Best kept in a cool, dark and dry place. Small flowering shrub or tree with pink flowers and bright red fruit that have red seeds contained in a pod. The triangular-shaped Achiote seeds are surrounded by a red pulp that is separated from the seeds and pod when they are harvested. Flavors: It is a seed and used as a spice. Food complements: Recado rojo which means achiote paste. Choosing: The seeds are harvested and ground up for use as a paste. Buying: It can be purchased in the store as a processed ingredient such as a spice or paste. Procuring: Cultivated in the Americas and in Southeast Asia. Used by the native Americans as paints and dyes. 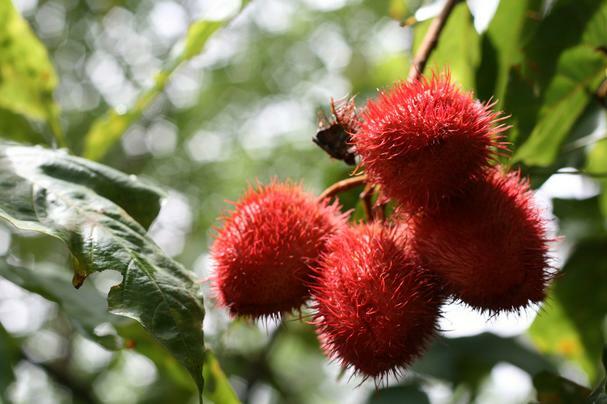 It is harvested from the annatto shrub which the seeds are protected by a pod containing 50-100 seeds. Added as a spice, paste or a color for food dishes, or dyes and paints. History: It was introduced to Southeast Asia by the Spanish in the 1600's. It was also used by native Americans as body paint, lipstick and hair dye.